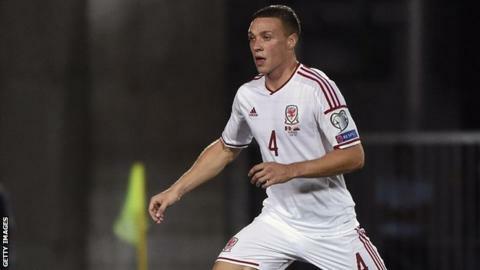 Wales defender James Chester hopes new national coach Paul Trollope can continue the good work done by outgoing assistant boss Kit Symons. Fulham manager Symons stepped down to concentrate on his role as Cottagers boss. Cardiff City head coach Trollope, 43, has joined Wales on a part-time basis with Osian Roberts promoted to become Chris Coleman's number two. "Hopefully Paul can continue with the form that we are on," said Chester. "I think Kit's done a great job, but it was always going to be difficult to juggle a full-time job in the Championship [with Fulham] with assistant manager of Wales. "I'd like to thank him for all he's done." Wales are currently top of their Euro 2016 qualifying group with four matches to go and next face Cyprus and Israel in September. On Saturday Coleman's side will find out their World Cup 2018 qualifying opponents when the draw is made in St Petersburg, Russia.